We don’t drink cow’s milk in our house. I didn’t grow up on the stuff, and just never liked it. Plus it makes everybody phlegmy around here … who needs that? It’s easy to have a dairy-free diet nowadays, as there are lots of milk alternatives out there: soy, almond, rice, oat, and hemp for example. I’m a big fan of almond milk, and make it frequently. But Ecodaddy isn’t so fond of it (unless it’s warmed up with a splash of maple syrup, which is super-delish! ), and so we still spend a chunk of change on store-bought rice milk. Compared to nut milks like almond, rice milk lacks beneficial protein and fats and is quite a bit higher in carbohydrates. However, many like it because it is a low fat choice, and hey: sometimes you just need some cold, yummy white stuff to moisten your bowl of cereal, ya know? Lucky for me, a few weeks ago a friend posted her rice milk recipe on Facebook, and I was ready for a new kitchen project. I am happy to report it was easy and cheap to make, and totally delicious to drink! I’ve since tested this recipe twice using two different types of rice. 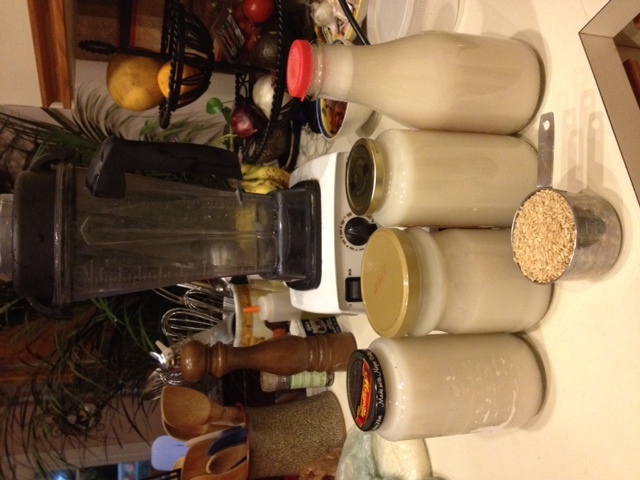 I got 3 quarts of rice milk from the first batch and 4 quarts from the second. I had coupons for Lundberg organic brown rice that I held onto until it was on sale, making my final rice cost a mere $.50 a cup. Tweaking my friend’s recipe, I added some vanilla extract to the final product, but didn’t like it because I could taste the alcohol from the extract. In batch two, I added half a vanilla bean during the cooking time instead, with much better results. I also found that the type of rice you use determines whether you really need to add a sweetener or not. I used a sweeter type of rice the second time (Lundberg Golden Rose). Flavored with just the vanilla bean, it didn’t need any sweetener at all. Put 8 cups of water in a big pot and bring to a boil over high heat. Pour in rice and stir. Cover the pot and lower the heat to let the water simmer. Cook for 3 hours stirring occasionally, til it looks like very soupy rice pudding. Turn off heat and stir in salt. 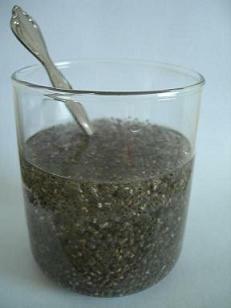 In batches, fill your blender halfway with cooked rice mixture and halfway with water. Blend until very smooth. Strain twice through a fine mesh strainer, collecting rice milk in mason jars. Continue on with remaining cooked rice mixture until you’re finished, filling jars with rice milk and screwing on lids tightly. Even with the extra water, this rice milk can end up thicker than the product you find in the store, almost like a rice cream. My second batch was thicker than the first and required another whirl in the blender with more water: 3 cups rice cream to 1 cup water made it perfect. Since it doesn’t have preservatives, presumably it won’t last too long in the fridge. I’ve kept mine in there a little over a week and it was just fine. Make sure to shake before serving, as there is some separation, plus the tiny black vanilla specks settle to the bottom.